Welcome back! Last time, we began talking about the common summertime pests to be wary of. If you’re like most living in Piedmont, you have your normal array of insects living in your yards such as bees, spiders, and ants. Sometimes, people will see an increase in pest numbers and may also see the addition of new bugs and rodents coming into their yards and homes during the summer. When pests stay outdoors, they can be annoying, but at least you know they are where they belong. It’s when they start moving inside that pests can become increasingly annoying and in some cases, dangerous. 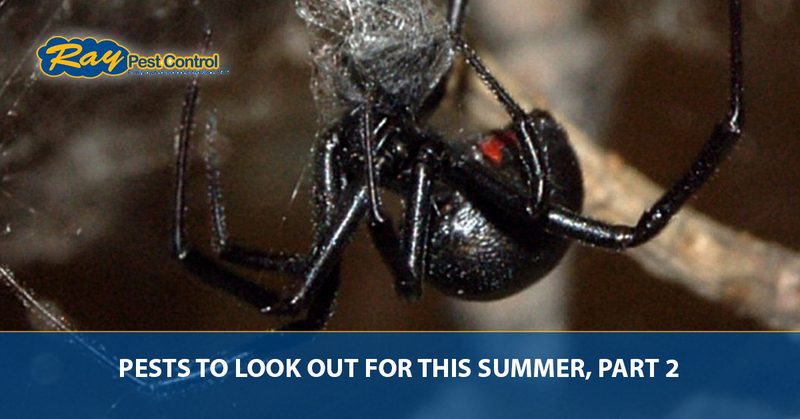 Here are a few more pests to look out for this summer. Should you require the help of experts to remove pests and prevent future infestations, call Ray Pest Control in Piedmont for an inspection and service. Spiders can actually be quite helpful in preventing and controlling other summertime insects from bothering you while enjoying the outdoors or from entering your home. Spiders eat bugs like mosquitoes, flies, and other prey, but when spiders invade your home, it can be quite unnerving — and even dangerous. If you have a high amount of spiders in your home (no matter which type or species), we can remove them so you can safely and comfortably enjoy your home again. Fleas and tick season in North Carolina is year-round, but they can become more active in the summer. Fleas are a common pest that feed and live on household pets and wild animals, but they can become an itchy nuisance to humans when pets become infested. Ticks are much more dangerous, especially to people, because they carry and transmit Lyme disease, a serious autoimmune disease that is treatable, but there is no definitive cure. Earwigs are also a common year-round problem in North Carolina, but they become even more active during summertime due to the increase in humidity. Earwigs, though quite terrifying looking with their intimidating pincers, are actually a beneficial insect because they feed on destructive insects. They prefer to live in dark places with high levels of moisture. They are a destructive insect in their own right because they feed on flowers, plants, and shrubs causing damage to people’s gardens and landscapes. They may even completely destroy healthy plants. If you have any nuisance or destructive pests and insects that have taken over your yard or interior of your home, call Ray Pest Control in Piedmont for safe and effective pest removal services.